Construction activity in Melbourne hit a peak this February. At the beginning of the month, excavation works began on the future site of ANZAC Station in the metropolitan area as part of the multibillion-dollar Metro Tunnel project. This meant that excavation works were now underway on all five Melbourne Metro Tunnel station sites. The project has been a centrepiece in the state government’s massive infrastructure spend, including $4.3 billion on roads alone at the last state budget, and complements other major transport infrastructure projects across the state, such as the Level Crossing Removal Project and CityLink-Tulla Widening. For Victoria, this suite of transformative infrastructure projects has partly contributed to it retaining a top spot on the latest CommSec State of the States report. Released in January, the quarterly state and territory economic performance report provides an analysis of how each region is performing based on eight key indicators. These are: economic growth; retail spending; equipment investment; unemployment; construction work done; population growth; housing finance and dwelling commencements. For each state and territory, the results in each key indicator are compared with decade averages – or the normal performance of that state or territory. According to the report, which covers the September 2018 quarter, Victoria and New South Wales shared the top spot of best performing Australian economy, with Victoria leading construction work done at 38.2 per cent above its decade average. 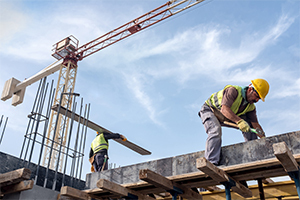 In addition to the construction ‘boom’ being experienced in Victoria, construction work in the September quarter was higher than the decade average in five of the states and territories. CommSec Senior Economist Ryan Felsman explains that the key indicators are equally weighted to provide an accurate picture of each region’s economical performance. So, while infrastructure spending is at a major high for many states and territories and provide obvious benefits such as job growth, construction activity and equipment purchases, he says a correlation between the bounty of transport infrastructure projects underway and these key economic indicators isn’t necessarily the case. “Infrastructure spending is very buoyant on different transport projects and we have seen very significant pick up for jobs in construction. But, whatever correlation between them, I would argue we have to factor in other parts of the infrastructure puzzle,” he explains. New South Wales, for instance, was second strongest in the construction work done indicators at 34.5 per cent above the norm. But, it held the trend unemployment rate of 4.3 per cent – a stat that hasn’t been bettered in monthly records going back to 1978, according to the report. Mr. Felsman says NSW may be doing well construction-wise due to major transport infrastructure projects, but, like Victoria, its residential building sector isn’t as strong as the ACT. In the report, the ACT tops the tables for dwelling starts at 88.5 per cent above decade averages. Likewise, the ACT leads the nation for housing finance at 32.8 per cent up on its long-term average with Tasmania being the next strongest at 22 per cent on decade averages, which Mr. Felsman says reflects both regions’ strong residential housing market. While there are various contributing factors to the economic buoyancy of each state and region, Mr. Felsman says there are other positive growth sectors relating to the infrastructure construction market being felt across the country. He says the equipment investment indicator, which is more focused on capital projects and related machinery, has shown some positive outcomes, particularly for Western Australia. Equipment investment in the state was up 17.5 per cent on the year before and was near a four-year high, with Mr. Felsman saying retail spending and business confidence is also on the rise. “Western Australia came off the bottom of the table in the last report’s standings too. It’s a very glacial improvement but there are green shoots coming through in lithium and iron ore,” he adds. Tasmania also saw significant growth in equipment investment and leads the states in this indicator at 35.7 per cent up on the decade average, ahead of New South Wales up 9.9 per cent and South Australia up 9.7 per cent. Likewise, he says South Australia is seeing its own slight economic gains through movement in the energy project market and a change of government. Looking ahead, Mr. Felsman says Victoria and New South Wales will most likely remain strong economically across the board, but we can expect to see the rankings shift again. “I think both states are in good standing, but given the property downturn in Sydney and Melbourne, we can expect to see more changes happen across the country between June and December this year. For example, a possible change in federal government could further boost jobs growth and housing activity in the ACT, where home prices remain positive.